Kowa YF binoculars were specifically designed for young users. 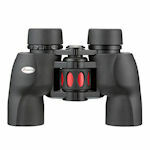 These are porro prism binoculars in 6x30 and 8x30 models, featuring a smooth easy focus mechanism weighing under 17 oz. Kowa YF binoculars are nitrogen-purged and waterproof.